I don't know if it's the traveling or the new cleansing product I tried from my BirchBox, but my face is DRY. What's worse is for once my trusty argan oil isn't cutting it. So I quit the cleansing product (which this is the first thing in a year that I have tried in my BirchBox that has even hinted at not working with my skin) and have been putting everything from old lady moisturizer to argan oil every few hours to try and combat this with not much luck. Then I was on the plane headed to Amsterdam on Saturday and Duty Free was available on the plane prompting me to browse through the catalogue to see if there was anything that might be able to assist with the flaky lizard like state my face had become. Enter in Kiehl's. Years ago Kiehl's was my go to beauty regimen products, but if you haven't noticed I love to try new products and Kiehl's fell off my radar. 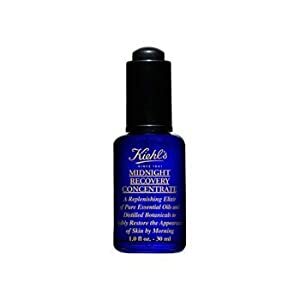 When I saw that I could purchase the Midnight Recovery Concentrate, I knew that my skin was going to be healed. So in combination with the Ultra Facial Cream (also available on the flight) I woke up this morning to my skin visibly less dry and dramatically softer than when I went to bed. I still have a few dry patches, but a few more nights and I think we will be back to normal. Which is good, because right now I am looking a little tired due to jet lag and I can use all the help I can get! I may have picked this up as well, but only because I needed to distract from my scaly skin. Really.